A study shows that 92% of men want women to make a signal and let them know that they’re interested in them. Sometimes, doing that takes guts; it’s just not easy to do. At the same time, you would not want to pass up the chance, especially if you have someone you are really interested in. Muster up your courage and take charge of what you want. 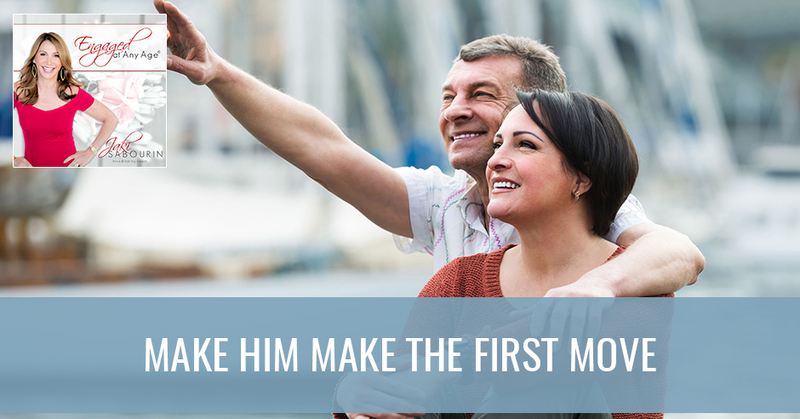 Jaki wants you to take note of six tips that will help you make him make the first move. I want to give you six tips on how to make him make the first move because I want you to signify interest in someone and I know that takes guts. There’s so much reward to be had in it if you can do it. Beyond the obvious is in getting into a potential relationship, you could walk away having learned something about yourself. When you take more risk in life, the bigger the risk, the bigger the game and you don’t have anything to lose and men are up for this. A study showed that 92% of men what women to signal them or approach them and let them know that they’re interested in them. I want you to take note of these six tips that are going to help you to make him make the first move. The first tip is to be confident and use that five-second smile. I know this is hard for a lot of you ladies, but it works. I want you to know that it’s not desperate. It’s only desperate if you feel desperate. Focus on the part of you that is confident and knowing that what you want is what you’re going to get. You have to go after what you want. That five-second smile gives him an opportunity to recognize and realize you’re interested in being approached by him. I know it’s challenging, but you have to sit there and notice a man that you’re interested in and when you see him, just give him that smile and sit there and do that. I know it’s uncomfortable while you’re doing it, but you hold that smile and he will either do one of several things. He will either approach you because you gave him the signal. You are letting him know that you’re approachable with that beautiful smile. It’s confident and it lets him know you’re interested in him or he won’t approach you, which means maybe he’s in a relationship. He’s occupied or he’s not interested. It doesn’t matter. You got a lot of information in those five seconds and that’s what you need to stop wasting your precious time. That’s why this is such a valuable tool. Be confident and give that five-second smile and practice it in the mirror. Practice is the key to creation. It’s a key to getting anything you want and it’s the key to getting out of your comfort zone. Make sure you use it. Tip number one is being confident and smile. Tip number two is I want you to be slightly touchy-feely. What I mean by this is whether you’re trying to get his phone number at the bar or he’s getting yours, you can give him a strong signal and get him to ask you out by touching him. What I suggest is touching his forearm, putting your hand on his hand or on his shoulder. You reach over and you’re saying, “It’s nice to meet you.” Making that physical contact is a subtle form of letting him know that you’re interested in him asking you out. You want to give him these obvious signs to help him to ask you out. Men are just as nervous as you are. As long as you hold back, they’re feeling you’re not interested. Sometimes you need to get out of your comfort zone and take these tips and start to apply them so that you can cut down on the time that you’re single. That’s the whole reason why you’re reading this, to begin with. You’re tired of being single. I want you to like, share and comment on my videos if you’re finding value in them so that other people can find me, because I know I’m helping a lot of women. I want to help everybody get engaged at any age. I’m going to share with you tip number three, ask for what you want. I know that it’s hard to ask for what you want and it sounds easier said than done. You can simply ask for what you want and you won’t believe how well this goes over. It can sound something like this. Maybe you’re out with your friends and you’re all decided to move on to a new location. All you have to do is say, “We’re going over to the Hard Rock, why don’t you join us?” or “We’re going over to the Hard Rock, why don’t you come?” or, “We’re going over to the Hard Rock, you should join us. You should come.” It’s casual. “You should join us. It’s going to be great. We’ll see you there. We’re heading over there now,” and then you delete. If he shows up, he’s interested. If he doesn’t, it’s no big deal. It’s like you’re reaching out as a friend and checking in to see if he’s interested or not. It sends the right message and that’s the important thing. You want to send these signals and these messages using these tips, so he gets the signal to ask you out so that you don’t have to be that one that’s pursuing. When you do this, you’re going to expect him to run with the ball and set up the date. You’re not going to set the date up. Let’s say for example, if he does come over because you say, “We’re heading over to the Hard Rock. You should come,” and he comes over there. It’s going to be up to him to ask you out and to pursue it. Maybe you’re listening to music at someplace and there’s a party or something and he’s like, “I love this band. It’s one of my favorite bands.” If you heard that they were coming to San Diego, you can say, “They’re coming to San Diego. We should go sometime.” Just like that. It’s casual, like it fell out of your mouth. You’re not pursuing him. You’re excited. You’re following something that he’s passionate about and you’re making a suggestion. You’re not hitting on him or asking him out. You’re saying, “We should go.” It’s like a figure a speech and then he, at that point, needs to take the hint, pick up the hanky and ask you out. If he doesn’t, that’s okay. You took a risk and you’ve got information from it. That’s why it’s important to take these risks. Don’t be afraid to feel like you’re getting rejected. It’s a redirection and you have to put yourself out there. As I said, 92% of men want to be approached by women or are okay with being approached by women and encourage it. They’re nervous too and they want a clear signal from you that it’s safe to approach you and it’s safe to ask you out. You’re going to say yes. This is setting it up to help them ask you out. You are helping them by following these tips. Here’s tip number four. This one works and I love this. Let him help you with something. This could be something like if you’re at a bar and he offers to pull out your chair. Say, “Thank you.” Don’t say, “No, I got it,” because that’s an automatic response for a lot of women. They’re like, “No, I got this,” but you’re like, “You don’t get it. You want him to get it.” You’re like, “Thank you so much.” Maybe you’re coming up to the bar and not everything’s in a bar. It could be a Starbucks or anything and you’re standing in line and your hands are full. You could turn to the guy next to you and say, “Would you mind holding this for me for a minute?” He’s going to hold it. First Move: Don’t be afraid to feel like you’re getting rejected. It’s just a redirection towards something better. Give them your briefcase, ask him to hold it. Ask him to hold a shopping bag. Ask him, “Excuse me, can you hand me that please? I can’t reach that,” or, “Would you do this for me?” or, “Would you mind getting the bartender’s attention?” Ask for help. Men respond well to this because they do. They want to help you and you’re giving him an opportunity to do so. That means that he is already setting up to be in that position of being there for you. You’re teeing that up. You could also do something like asking him to look up something on your phone. Maybe you guys are talking and all of a sudden you’re going to leave to the next place. You’re there with your friends or wherever you are. It could be a party. It could be a friend’s. It could be a Starbucks. He has his phone and you don’t have yours. You could say, “Excuse me, would you mind looking something up for me? I’m getting ready to head down to this restaurant, Catania, and I’ve never been there. Do you know where it is or could you give me directions or look at those up on your phone for me?” Then smile. He’s going to look it up on his phone for you and he’s going to talk to you. You’re going to strike up a conversation and that’s segueing into him possibly asking you out. You’re teeing it up. You’re letting him know you’re interested and you’re open and that’s a big thing. Tip number five and this one’s fun, linger around. Hang out. I did this myself. I’m going to share with you a story that I used the linger tip and it works. Use your time wisely, especially if you see someone that you’re interested in. You want to be subtle about it, but he will notice that you’re lingering and he will take that as a signal if he’s interested in you. The best approach to that is your proximity to him. You want to make sure you’re standing near him or if there’s a group of people you at least are positioning yourself so that you’re closer to him than the other people there so that he gets the sense, the vibe, the feeling that you’re interested in him. That’s the point of it. You linger near him. My story is I went to a coffee shop. I rode there on my bike. I parked my bike and I was lingering right there at the entrance of the coffee shop. It was outdoor seating and I had gone in and got a cup of coffee and came back. I was lingering because there’s no place to sit. I was hanging out. I had my coffee. I was not on my phone. I was drinking my coffee, listening to the conversation, looking around, smiling to myself and acting happy. Sometimes you have to fake it until you make it. I was happy, but it was definitely awkward and I was nervous. I was playing the role of being happy at that moment. In other words, I was projecting happiness outwards. I was smiling and admiring the birds. There were birds in the tree and I was listening to that. I was appreciating life and putting the vibe out there that I was approachable. There was a guy sitting at a table and he called over to me and said, “Excuse me, would you like to join me?” I’m like, “That would be great.” I sat down and we end up having a conversation, which led to a date. He asked me out, but I did linger. The lingering helps. If you’re in a club, you’re in a bar, you’re in a restaurant or you’re in the lobby or someplace, linger. Stand outside of the elevator and linger with him. Talk to him for a moment. Give him an opportunity to put it together that you were interested in him. That’s why you need to linger. I’m going to give you a final tip. Here’s the way that you can get him alone. Getting him alone is going to send the signal to him that you’re interested in him and have him ask you out. Maybe you are in a room together with a bunch of people. First of all, what you can do is you can draw him away to the side and you can say, “Excuse me, can I ask you a question?” He’ll step aside or away from the group while you engage him in something. You could ask him something about the area. You can ask something that’s relevant to the conversation. You can ask them something about a friend, “I know my friend’s birthday’s coming up and I want to surprise them. Do you have any ideas about a gift?” Make sure you have an idea of what you’re going to ask him when you draw him away. You could simply say, “Excuse me, can I talk to you for a minute?” Then he turns away from the group. At that point, you’re making a more intimate connection with him. You’re creating a little bond, which is a great place to go. From that point, he is in a position to definitely ask you out because you made this little connection. You’re on this friendship level, which could easily dovetail into a relationship. I wanted to say that a lot of these tips will help you materialize an opportunity to go on a date. You have to put yourself out there. You have to learn these tips because they will help when you’re out in real life. That’s where it’s all happening. You’re out there and you’re not all online dating. You’re out in real life. When you get out there, you clam up and you freeze up or you run away and you don’t know what to do. I know that these tips will help you if you follow them and practice them. I also want you to know is to stop buying into society’s restrictions about who should ask who out. I know that I talk a lot about masculine and feminine energy. When we look at where we are now in our society and what the studies are showing is that men are completely okay with being approached, my husband included. I talked to him about it. Before we got married, he was approached by women. He said he was relieved because it let him know at least they were interested and if he approached them, he wasn’t going to get shut down. These six tips are a more subtle form of tips. You’re not outright asking them out, but you’re giving them strong, clear signals that you’re interested in continuing a deeper discussion or a date or something that might lead to a relationship. I want to tell you about my freebie. I want you to go to SoulmateIQ.com and download my free quick assessment. It’s my Soulmate Assessment. It’s going to tell you what frequency you’re vibrating at and help you get quicker into alignment. I’m going to send you a feminine exercise along with your assessment. This assessment is going to give you some insights into if you’re coming off too needy, if you’re coming off in your masculine energy or if you’re controlling. It’s a quick quiz. It’s going to take you a few seconds. You’re going to get that delivered directly into your inbox. Take advantage of that. The last thing I want to wrap up with is I’m excited to share with you that I’ve opened the doors to my annual program, Engaged At Any Age. It’s a program where I teach women how to deliberately date and consciously create the man of their dreams in a very intimate and private setting. It’s only available once a year. The enrollment is open for a limited time for a select few women that are truly ready to do what it takes to call them their soulmate and be engaged in a committed relationship. I want to thank you so much for being here and joining me for this episode. I’m sending you lots and lots of love.